Happy snowy day in Boston! Vietnamese Pho Soup may look intimidating (or strange), but it’s so simple. You make a broth, cook the rice noodles and assemble. I originally made a Vegan Pho with tofu because it’s easy to use and requires no prep, but, like the rest of you carnivores out there, I knew I needed to try a try meat lover’s option… with BEEF. I swapped vegetable for beef broth and did a 1:1 ratio of rice noodles to zoodles. As always, pho is light, refreshing and just what the doctor (or nurse) called for on a cold day. The sriracha and jalapeños add just the right amount of spice, the herbs contribute a freshness and the spices just the right flavor. Dish up a heaping bowl of Beef Pho with Zoodles. Happy Meatless Monday! 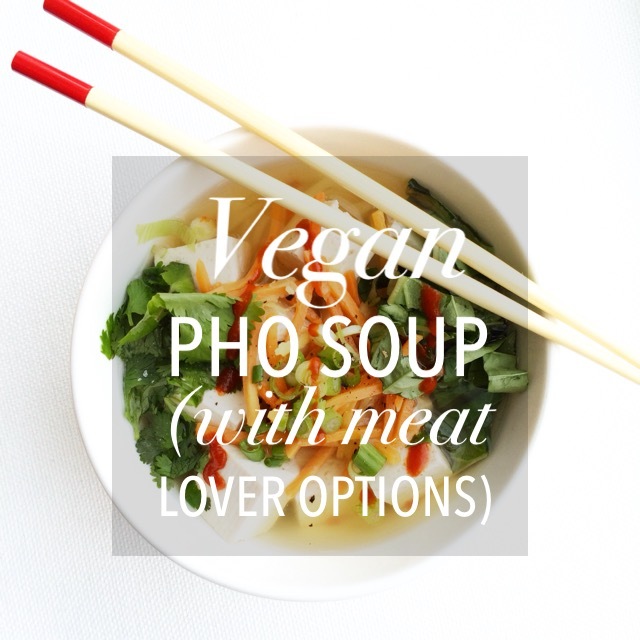 Vietnamese Pho Soup may look intimidating (or strange), but it’s so simple. You make a broth, cook the rice noodles and assemble. I originally made this with tofu because 1). I had it on hand; 2). I was pressed for time; 3). it’s easy to use and requires no prep; and 4). why not? But for you carnivores out there, you can easily convert this to a “meat lovers” version by adding chicken, beef, pork or shrimp and then substituting chicken or beef broth for vegetable. This soup is light, refreshing, just ticket on a cold day. The sriracha adds just the right amount of spice, the herbs add a freshness and the spices just the right flavor. It’s also so easy to make it your own!